Thank you for joining me as we count down to the next MFT release. We are four days away from the big day! All the new Stamps, Die-namics, and Stencils will be available on Tuesday, August 4 at 10:00pm EST. Be sure to check out the MFT Blog to see all the new items being revealed today. Don't forget to leave a comment on the MFT Blog countdown posts, YOU could win one of the five $75.00 gift vouchers. I have two tropical themed cards to share with you today. 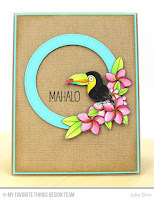 The first one features a few stamps from the new Birdie Brown set, Polynesian Paradise. This set is full of cute images and fabulous sentiments. 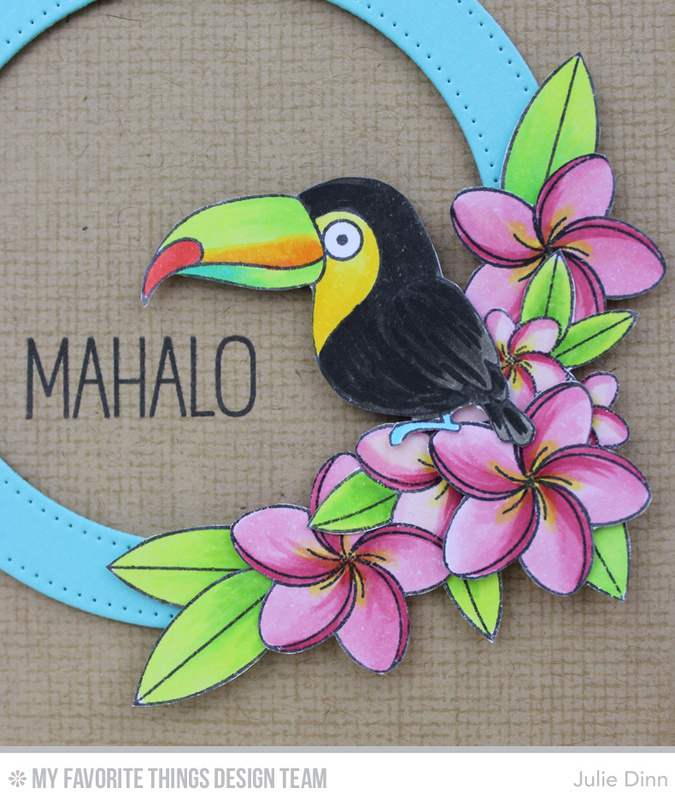 I stamped the adorable toucan and the flowers on a piece of X-Press It card stock and I coloured them with Copics. I placed them all on a Pierced Circle Frame. The background was stamped with the Burlap Background and Kraft Premium Dye Ink. A simple Mahalo finished off the card. 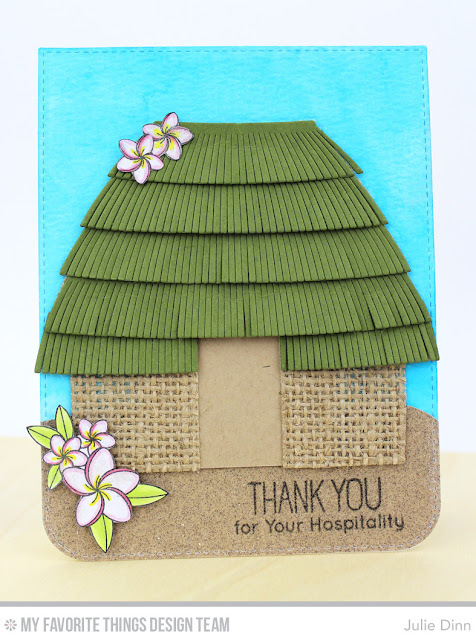 My second card features the amazing Tiki Hut Die-namics. How cool is this die? Seriously fun! I die-cut the house in Burlap, Jellybean Green, and Kraft card stock. I added a few flowers from the Polynesian Paradise stamp set. The sentiment was stamped right onto a piece of sand paper. Thanks so much for joining me again today. Don't forget to check out the MFT Blog to see all the gorgeous creations the design team has to share with you today. WOW,WOW and WOW! Beautiful cards! The colors you used on both cards make the card very stunning. Love the burlap on the hut...just perfect. Awesome cards Julie. I love how you used burlap for the front of the hut. Very clever! I just love this card. Stunning colors. Lovely cards--just super! Great projects and great products from MFT. Thanks for sharing! I ❤️ How you colored those plumerias. Absolutely gorgeous cards. Your toucan card is so tou-cute. That Polynesian set is wonderfully whimsical. Super cute!! Fabulous detail in the coloring. 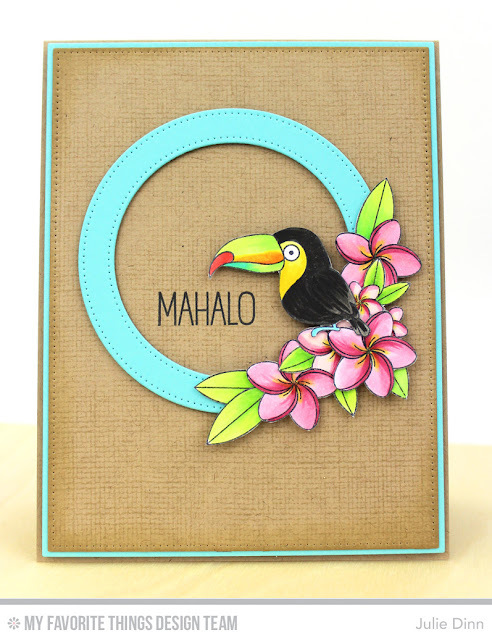 Your first card is super cute with the toucan swinging in the circle frame - perfectly gorgeous! Love both cards. Such fantastic texture and dimension. Fun cards! I love how you added texture to them. Such fun. The tiki hut is so cute. I love these cards... Soooo Tropical and takes me back to being in Hawaii. Beautiful! both cards are so beautiful, I love the texture in the second card!!! !